United Airlines Will Ban Dozens Of Dog, Cat Breeds In New Pet Guidelines : The Two-Way As of June 18, a handful of cat breeds and more than 40 types of short-nosed and strong-jawed dogs will no longer be allowed in the cargo area. In-cabin rules are still under consideration. 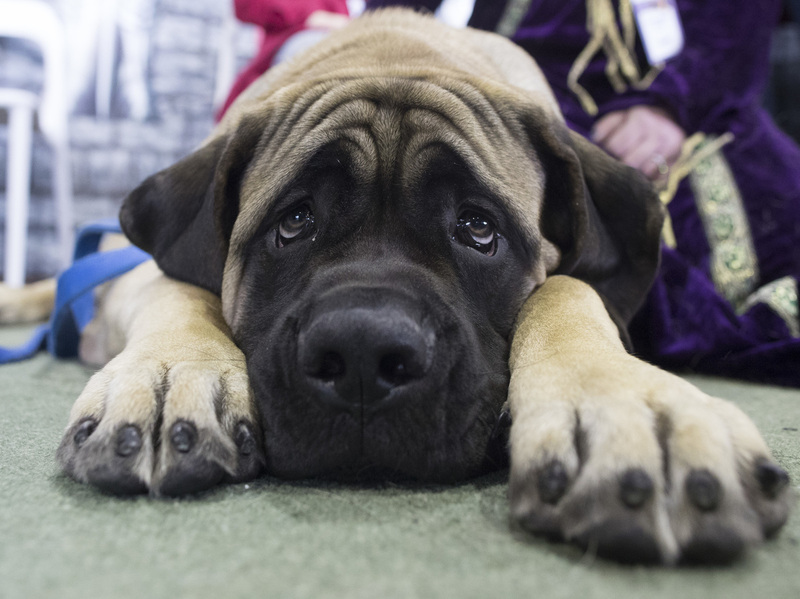 Dunkin, a mastiff, is among the breeds that won't be allowed to fly in the cargo section of United Airlines flights as of June 18. He's shown at the Westminster dog show in February. Following the death of a dog aboard a United Airlines flight that provoked an onslaught of criticism on social media, one of the nation's largest carriers will ban certain breeds of cats and dogs from traveling. On Tuesday the airline announced changes to its travel guidelines that would prevent future transport of more than 40 breeds of dogs and certain cats in the cargo hold "out of concern for adverse health risks," the airline said in a statement. Under the new policy, United said it would allow only acceptable breeds of dogs and cats in the cargo hold and would no longer carry other species of animals there. Effective June 18, some short-nosed or snub-nosed dogs, including pugs, Boston terriers and French bulldogs — the breed of the dog that died in March — won't be allowed to fly in the plane's lower compartment. Bigger, strong-jawed dogs have also been added to the no-fly list. That includes the American pitbull; the Dogue de Bordeaux, one of 16 types of mastiffs; and the Belgian Malinois. Persian, Himalayan, Burmese and exotic shorthair cats will also be forbidden in the cargo area. "We are doing this to further minimize risk and ensure the comfort of pets we fly," Charles Hobart, a spokesman for United Airlines, told People. "We flew all sorts of animals. Geese, foxes, leopards, you name it, we pretty much flew it. That will change moving forward. We'll only fly dogs and cats as pets that belong to our customers." United Airlines partnered with American Humane to come up with the new rules. "Certain breeds have unique respiratory challenges due to the anatomy of their noses and throats, and are more prone to risk when under stress or exposed to other environmental changes," United Airlines explained in an email to NPR. "American Humane will be performing a top-to-bottom examination of every aspect of air travel affecting the health and welfare of animals, and making recommendations for changes and adjustments to United's service," the email said. To protect pets traveling from extreme heat conditions, United said it would also stop flying animals headed to Las Vegas, Palm Springs, Calif., and Phoenix and Tucson, Ariz., between May 1 and Sept. 30 that would normally travel in cargo for those flights. Emotional support and psychiatric service animals are also accepted in cabin for qualified individuals with a disability if certain information and documentation are provided in advance of travel. The new restrictions come after an investigation into the events leading up to the death of a French bulldog that was stored in an overhead bin. According to a passenger who was on the flight, a flight attendant told the owner of the dog that she needed to store the dog with carry-on luggage. By the end of the three-hour flight, the family found the small dog lying lifeless in its traveling bag. At the time, the airline issued a statement calling the incident "a tragic accident that should never have occurred, as pets should never be placed in the overhead bin." Problems for the airline transporting pets continued. A day later, United Airlines mistakenly flew to Japan a dog that was headed to Wichita, Kan.